There are plenty of reasons to want to watch a show. You may have read and enjoyed the manga, you may love the studio and all they create, it might be the director’s name, the scriptwriter, or you might have read some good reviews or heard some strong word of mouth. But sometimes you might watch a show for the most trivial of reasons. 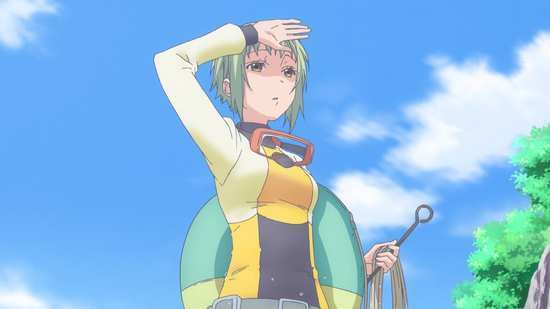 I had no idea what Amanchu was, had no idea that it was a slice of life show, or that it revolved around diving. But I did see a couple of screen grabs from the series, and for the life of me, the characters looked like anime muppets, Jim Henson in Japanese. From that moment on, it was my life’s work to watch Amanchu. Thanks to its UK release, the first in any English speaking territory, I now have that chance. 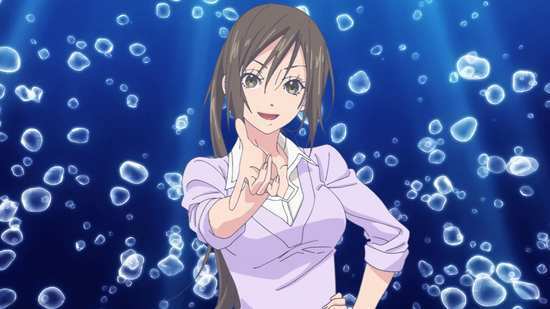 Hikari Kohinata is an irrepressibly cheerful young girl who loves to go diving, and spends most of her free time at the beach at her grandma’s diving supply shop, Amanchu-ya. And now that she’s starting high school, she’s looking forward to joining the school diving club. Futaba Ooki has moved to the isolated Izu peninsula from Tokyo, and meets Hikari on the first day of school. But Futaba is introverted, shy, and finds it hard to make friends. 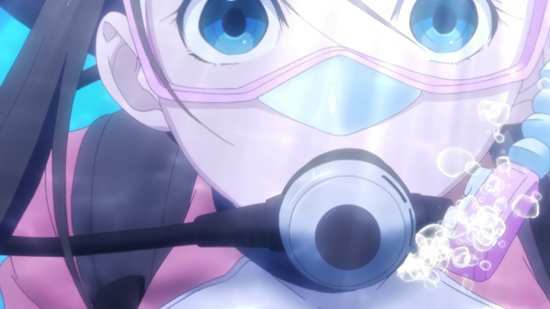 Getting to know Hikari, and being pulled into her world of diving, Futaba starts to come out of her shell. 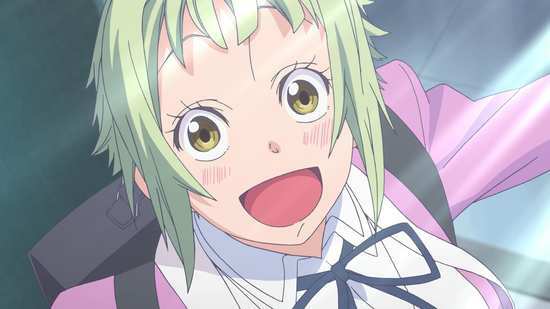 Thirteen episodes of Amanchu are presented across 2 Blu-rays from All the Anime. They’re not muppets. In this case, the unique look to the characters is this show’s version of SD. Super-deformed characters are a comedy short-cut in anime. When something goofy happens in a story, the characters can shrink to childlike proportions to emphasise that. 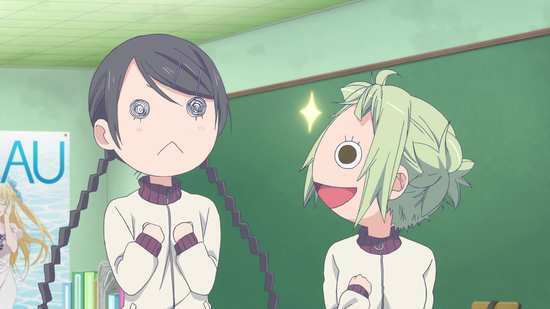 In Amanchu, the proportions remain constant, it’s just the facial features that get simplified, and in Hikari’s case in particular, she looks just like a muppet when that happens. Amanchu gets a 1.78:1 widescreen transfer on these discs, a transfer which is pretty good, clear and sharp, with consistent colours, and good crisp detail. 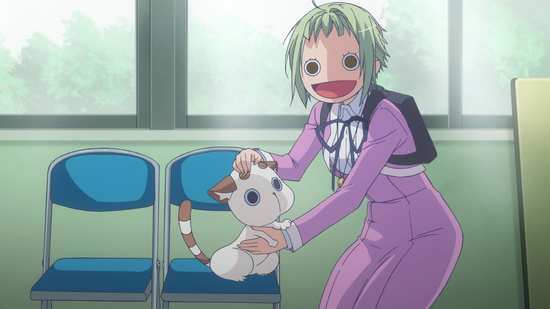 The animation is presented well, fluid and detailed throughout, while the character designs are memorable and rather unique, even without the comedy simplifications. For one thing, we get a school uniform where the shortness of the skirt, the gap between knee-high socks and skirt hem is never an issue. In this school the girls wear full length dresses. The transfer can be a little bright at times, and there is the occasional hint of digital banding. More of an obvious issue is shimmer on fine detail during pans. You can see this most on the bars on the school windows, when seen from a distance and at an oblique angle. The audio is in PCM 2.0 Stereo Japanese format with optional translated subtitles. The dialogue is clear throughout, the subtitles are timed accurately and free of typos, and the lossless clarity makes the most of the show’s audio highpoints, especially the mellow music. Unfortunately, this is one of those titles where the theme songs lack lyric translations. All of the extras are on disc 2. 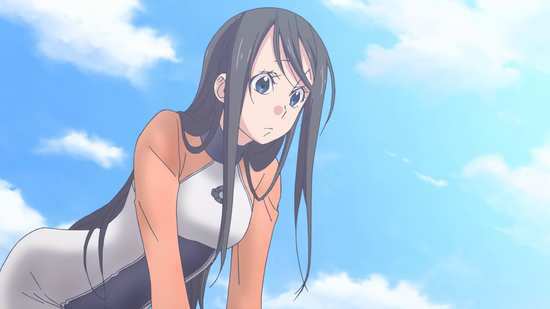 You get the textless credits of course, but more useful are the Amanchu Short Films, seven in total running to 48:44. They offer some light, comedy edutainment regarding the denizens of the oceans. I haven’t seen the physical extras with this release to comment. If you like keeping things organised and categorised, organise your anime collection on spreadsheets and databases as well as on your shelves, then here’s another genre to add a checkbox to; ‘iyashikei’. It’s a Japanese term meaning healing, which in this context is applied to shows with minimal conflict, and which promote a healing or soothing effect for the audience. If ever you’ve heard me describe a show as a ‘warm hug’ then it’s iyashikei, and I have a lot of time for this particular subset of the slice of life genre. We’re talking Azumanga Daioh, K-On!, Hidamari Sketch, and Non Non Biyori. In Amanchu, we might be getting as close as possible to the pure ‘iyashikei’ aesthetic. Not a lot happens in this show, but I wound up watching it with an appreciative smile and a warm glow in my heart for all thirteen episodes. It’s all about friendship, as most of these shows are, the platonic love that develops between people with common interests. The hook with these shows is just what that interest might be, whether it’s music, motorbikes, art... 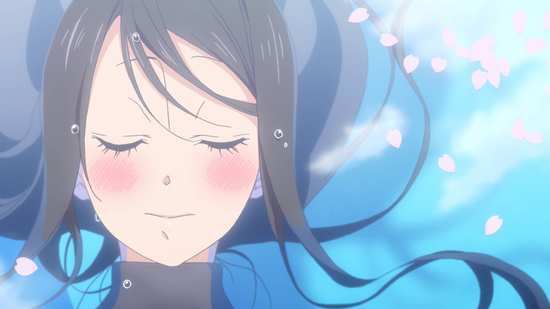 In Amanchu it’s scuba diving, the passion of Hikari Kohinata, and the pastime over which she bonds with transfer student Futaba Ooki. Futaba is the shy transfer student who’s moved to the coast from Tokyo, and instantly regretted it. She has a hard time making friends, isn’t at all outgoing, and tends to over-think things. It’s a good thing then that Hikari is outgoing, confident and friendly, and she latches onto Futaba, determined to be friends with the new girl in town, and introduce her to her favourite thing, diving. 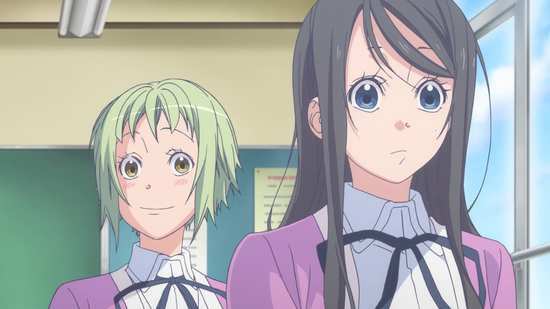 What makes Amanchu a little different is that Hikari isn’t presented as the ‘perfect’ friend, far from it. She’s a little too quirky, talkative certainly, but finds it hard to communicate what she has on her mind, so that she’ll resort to a whistle instead, or just make nonsense noises. It also turns out that she isn’t immune to the odd insecurity either, despite her extrovert nature, and it also appears that Futaba might be her first real friend. Amanchu is a slow burn of a show. 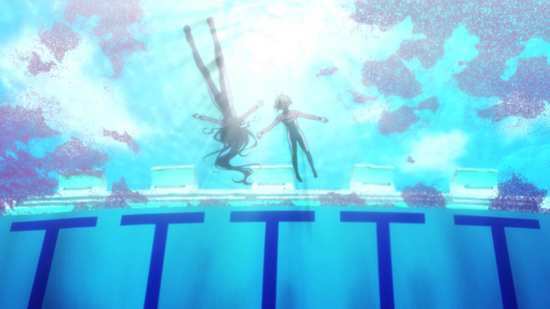 It takes until the second episode before Hikari can coax Futaba into a pool, and the twelve episodes of the main run are spent on Futaba getting to a point where she can share in Hikari’s favourite thing. That means joining the school’s diving club, learning how to swim, how to dive, and working her way up to getting the qualifications she needs to do so. 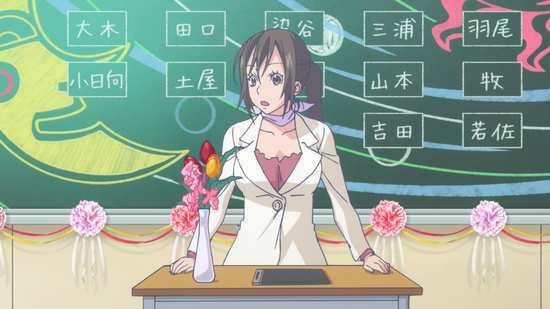 You get an idea of the cast in the opening credits, and we do meet the class teacher Katori Mato straight off, but it isn’t until the third episode that we learn that she’s the diving club advisor. 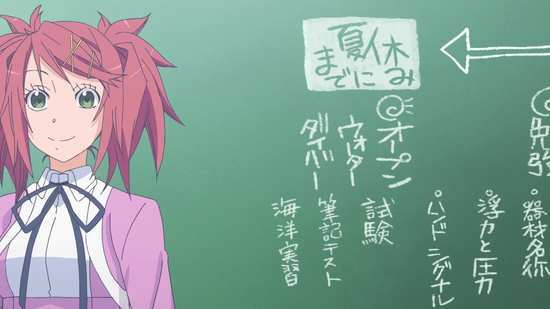 We meet a couple of red-haired ‘clients’ when Hikari is working as an assistant diving supervisor in the fourth episode, but it’s in the fifth that we learn that Makoto and Ai Ninomiya are the twins who are also their upperclassmen in the diving club at school. The show unfolds at a sedate pace that allows the character interactions and the slow passage of time to really sink in, lets you appreciate the gentle drama and warm humour of the story. There’s not a lot I can add to that, as these shows are about the little things, the quirky moments, the appreciation of delicate minutiae, and the ephemeral feel-good sense about the show as a whole. Amachu has something of a narrative, forward momentum in its story, insofar as it follows Futaba as she comes out of her shell, makes friends, and develops in confidence. The contrast between whom she was, and who Hikari helps her become, is made clear in the final episode when her friends from Tokyo pay a visit. But analysing and dissecting these shows is never wise. 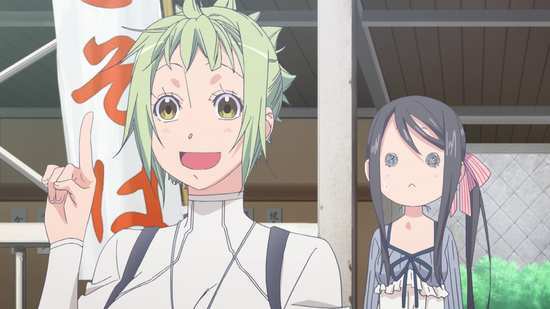 If they are ‘healing’ shows, then they are holistic medicine, and Amanchu is just what the doctor ordered.